Why Hoverboards Catching on Fire? Here’s how it can go wrong! Let us know some statistics. Here is one video hoverboard catching on fire. o be the special present for say the upcoming New Year, the Christmas or birthdays. However, some fatal incidents took place which triggered the major airlines from banning the hoverboard on the plane. What were these incidents and how did it spread like a storm in the industry of self-balancing electric scooter? Now a potential question that arises is whether the hoverboards are made of so vulnerable materials that they often catch fire or whether these materials are not up to the mark? Well, before actually dwelling with the tag that how fire is caused in the hoverboard let’s first see what these boards are significantly made up of. So, a hoverboard mainly comprises of a powerful motor, a microprocessor, lithium-ion batteries, and a gyroscope. The motor is used to regulate the board and is also used in the working process, the microprocessor works as the brain of the electric scooter, and the batteries drive the hoverboard while the gyroscope is used to check the balance of the board. It’s actually tricky to figure out at which point the train goes off the rail. As per our research, we list out the areas where the things can go downhill. Due to some fault in basic machine parts, there can be chances of the hoverboard catching fire. As we know that electric scooters are something which can hit any surface, bang around, or smash at high speeds, making it vulnerable to damage. So, there are special areas in which we need to pay attention both while buying as well as using. Who doesn’t know about the unguarded nature of lithium batteries? These have been used in mobile phones, tablets, laptops and electric cars for a very long time and also have a number of fire-related incidents. Does that mean that we stop using these gadgets? We’d probably leave this question to our potential readers. Most of the explosions which have been recorded so far have happened due to the unexpected battery explosion. Do these batteries catch fire by themselves? Not all though, some of them have exploded while charging and others while riding. A little insight into the inner functionality of the lithium battery will help you understand the reason more clearly. Inside the battery, as you know are two electrodes- one positive and the other negative. Now separating the two sides is a thin insulating sheet which is very delicate. The work of this separator is to keep the charge flow at both these ends apart so as to prevent any short-circuiting. The liquid present inside the lithium batteries is highly inflammable and certain factors may lead to the rupturing of the separator, hereby creating defects. In such situations, if you overcharge the battery or drop it, or hit it, it may out of nowhere begin an intense fire. Some of the fire caused by the defective hoverboards has been devastating enough to burn down the houses. That is why at most of the places in the US and the UK, hoverboards are not allowed in public areas and roads. The untested batteries are yet another big reason accounting for the same. It is therefore insisted to go for tested and certified batteries. Sometimes even the top brands can blindfold you. So be aware is all we can say. It’s always nice to charge your board with the original charger that comes along with it. It is similar to the way you charge your smartphones with its original charger to prevent malfunctions. It’s a good practice to research about the label on the charger and how safe it can be. Nowadays you need not stay awake to unplug your charger late at midnight. It comes with the automatic facility that does not take up any more charges once it is full. But who knows about the faulty chargers? They may consume an excess of charges, puncture the separator and explore the battery to catch massive fires. This is a part of the manufacturing defect exposed area where very little attention is paid. A slight error in the electric motor can take everything upside down. Although there hasn’t been a large number of a revelation of hoverboard fire due to such reasons, it still remains a black zone. We believe in seeing the darkest side to anything first and then seeing it through a new vision which brings in light and positivity. Following the similar pattern, we will take you to some of the dreadful journeys where the hoverboard fire incidents have created a history. In the year 2015, when hoverboards became a sensation both in the virtual and in the real-life scenario, boosting the sale. Due to increase in demand, some of the companies started manufacturing products with less assurance of quality and safety. The Chinese factories where the major parts were manufactured and assembled at different units began producing cheaper products to allure the consumers. Some of these cheap electric scooters turned out to be fatal. In December 2015, the shoppers were asked to evacuate a mall due to the fire caused by the hoverboard. Likewise, there was an incident reported in Pennsylvania where the electric scooter set the house ablaze when the battery exploded. Many incidents of road fire have been reported in the New York after which the government was forced to ban the use of hoverboards on the street and public areas. There are multiple videos uploaded on the YouTube which depicts the danger possessed by this electronic gadget and also some of the live experiences of the people. They are not actually meant to frighten you but to alert you of the mischief that the low-quality hoverboards lead to. Can you make a wild guess of how many hoverboards have caught fire until now? According to a report, The Consumer Product Safety Commission has noted more than 100 reports of sparkling and hoverboard fire up till the year 2016. Also, more than 5 lack products have been recalled after the reporting of so many fire accidents. The same year had the headlines featuring the death of an individual who had plugged in the hoverboard all night for charging. The Lithium-ion battery exploded post midnight. So, it’s dangerous, no doubts. But can we prevent these accidents? Can we have hoverboards which do not catch fire or which do not explode? Is it possible to manufacture fire-resistant hoverboards? Or it possible to manufacture batteries which do not explode? Why only lithium batteries are used for making the electric scooters? We shall provide you answer to all such questions swirling in your head. First of all, accidents happen when we are not taking the proper safety measures. So when the hoverboard manufacturing units undertake extreme care and attention while making the parts of the hoverboard, they will be less prone to accidents. 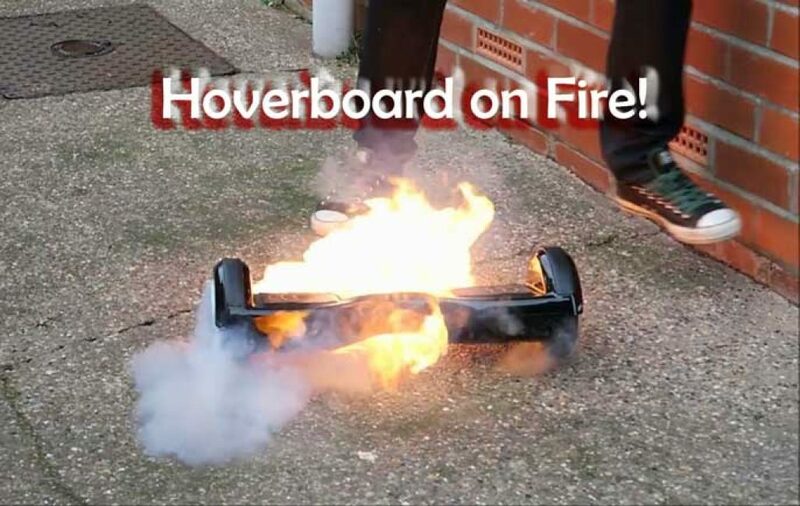 Secondly, it is possible to have a hoverboard which does not catch fire. Out of thousands and thousands of units sold, only a few of them have been reported to be defective until now. Not all of them turn out to be the devil. So those who are willing to buy a new board, do not lose hope. We shall be guiding you on which hoverboards to buy in the next article. When it comes to why only lithium batteries are used, the answer is quite simple. The energy density of these batteries is so high that they are capable of meeting great energy needs. That is the reason why they are used in mobile phones, and even in fuelling the electric cars. In the same price, no other battery is liable to produce the amount of power the lithium batteries can. Having got all your answers, you still might be wondering if the hoverboards really explode. To your surprise, they do not. Yes, it’s the battery that explodes and not the hoverboard. As mentioned above, the rupturing of the lithium-ion battery separator causes the separator to break and a slight increase in the energy density inside the battery may lead to its explosion. So, to prevent your hoverboard from burning or catching fire, you ought to take care of certain things. Firstly, buy only from a trusted manufacturer. The Underwriters Laboratory (UL) is a hoverboard testing firm which certifies the self-balancing scooters to be safe. Even the products on the top hoverboard selling websites must be UL certified to be considered safe. Secondly, once you get your hoverboard, take proper care of it. Do not overcharge, even if it has an automatic system to stop the charge flow. This is because overcharging triggers the damage of the separator, thereby giving rise to sparkling. Do not let your hoverboard overheat because that is a major threat. Always use branded and certified products. In case your original charger malfunctions, do not buy a cheaper one. Always trust on the quality because nothing is worth more than your safety. Do not hit your hoverboard too hard or ride continuously on an uneven surface as this might build up enough heat to catch the fire. It is good to discard the board once it has seen a slight sparkling or damage. Such boards are more prone to accidents. There are some brands of hoverboards like LayZ boards which have seen the maximum number of fire accidents in the past. So, it is better to altogether avoid buying those scooters. If you have one, then pay special attention while you ride them. Sometimes there can be defects in the wirings too. Make sure that you shake your hoverboard to test for any faulty or loose wiring. We care about you and your love for hoverboards and therefore recommend you to buy the best among the best. Although the UL hasn’t yet certified many of the hoverboards but it is on its move towards helping out the manufacturers over the world to meet the safety requirements. Now that we have talked about the reasons why hoverboards catch fire, it is important to mention about which hoverboards do not catch fire. It’s important to know which ones are safe to use and can be gifted to your near and dear ones. For that, we have out next article- buying guide for hoverboard where you can know about the best ones to buy.